Western Bottle News: More on the "Moonplant"
Back on February 6, 2010 we posted an article on Connell's Moonplant along with a picture of the bottle and an advertisement from the 1873 Sacramento Daily Union. 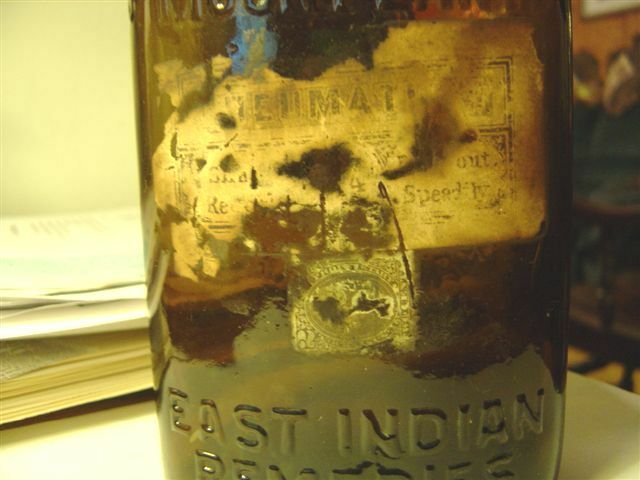 Several testimonials claimed the "Moonplant" helped cure rheumatism along with Ague and several other ailments. Here's confirmation that the "Moonplant" was definitely sold to cure rheumatism. Thanks to John & Margie Bartley of Donnels Creek Antiques of North Hampton Ohio for sending along a picture of their Moonplant with a partial label and tax stamp. Labels: More on the "Moonplant"